The TransNet Extension Ordinance and Expenditure Plan, approved countywide by voters in November 2004, includes an Environmental Mitigation Program (EMP) which is a funding allocation category for the costs to mitigate habitat impacts for regional transportation projects. The EMP is a unique component of the TransNet Extension in that it goes beyond traditional mitigation for transportation projects by including a funding allocation for habitat acquisition, management, and monitoring activities as needed to help implement the Natural Communities Conservation Planning Program. On February 22, 2008, the SANDAG Board of Directors entered into a Memorandum of Agreement (MOA) with state and federal resource agencies on the implementation of the EMP. This MOA was amended by the Board of Directors on April 26, 2013. For more information visit KeepSanDiegoMoving.com/EMP. A provision of the MOA also allocates $4 million annually for ten years to implement regional habitat management and monitoring efforts to help maintain the regionâ€™s biological integrity, thus avoiding the future listing of endangered species. Allocation of the $4 million is done on an annual basis by the SANDAG Board of Directors pursuant to a two-year work plan (last approved by the Board of Directors on September 23, 2016). A portion of the $4 million is allocated and distributed through a competitive TransNet EMP Land Management Grant Program to maintain the integrity of existing regional habitat preserves through enhanced land management. Eligible applicants include land managers from private nonprofit organizations, local jurisdictions, and other government agencies. One hundred and seventeen land management grantsÂ totaling approximately $16.6 million in TransNet funding have been provided to land management entities in the region through a competitive land management grant program. The ninth cycle of grants were approved by the SANDAG Board of Directors on July 27, 2018, and awarded $2 million to 19 projects. Quarterly status reports of active grant projects are presented to the TransNet Independent Taxpayer Oversight Committee and Regional Planning and Transportation Committees. On April 26, 2013, the Board of Directors approved the execution of an amended MOA to include a set of 11 policy points that clarified the definition, use, and process for release of funding related to the â€œeconomic benefitâ€� provision of the TransNet Extension Ordinance. Under the amended MOA, regional and local transportation projects that have received all of the required local, state, and federal permits for construction are eligible to release economic benefit funding pursuant to a prorate share formula included in the MOA. This milestone in the construction process of transportation infrastructure was identified to correspond with the last environmental clearance milestone that sets the final required mitigation obligations. 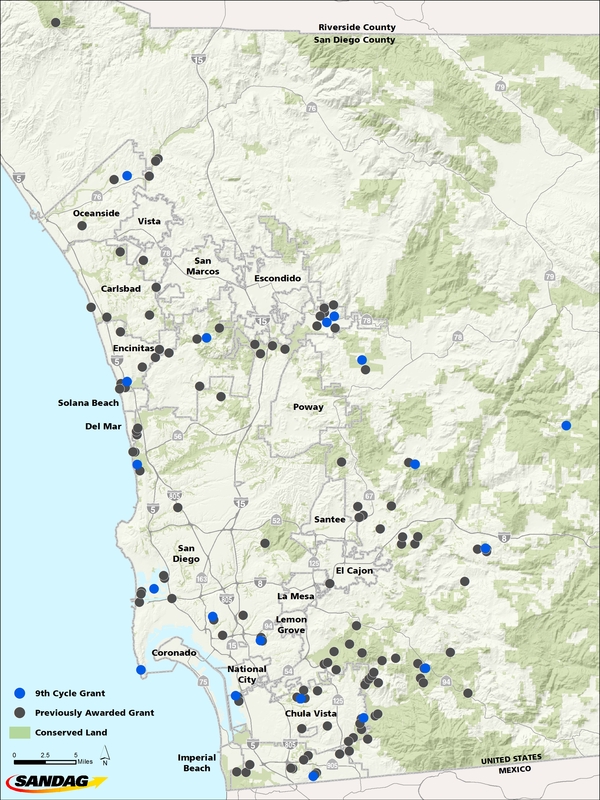 On September 27, 2013,Â the SANDAG Board of DirectorsÂ approved $20 million of economic benefit derived funds to be released through a competitive TransNet EMP Land Acquisition Grant Program, which would assist with land acquisition that promotes regional habitat conservation plans.